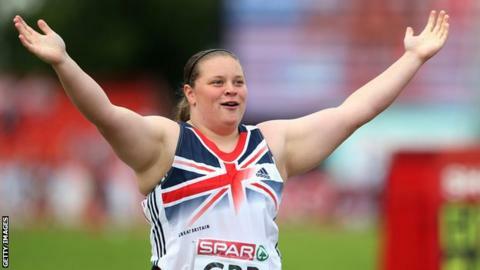 England's teenage shot-putter Sophie McKinna insists she will not be fazed by the extra attention when she takes part in her first Commonwealth Games. The 19-year-old's 17.12m was the best distance by any British woman in 2013. "Obviously as you become more successful and throw bigger distances people are going to start looking at what you throw. "But if I thought that way all the time I'd be too scared to go out and perform," she told BBC Radio Norfolk. "I just think about my own performance and going out and enjoying the experience." McKinna was confirmed last week in the England team for the Glasgow event, which starts on 23 July. The Great Yarmouth athlete has not matched her personal best of last season in 2014 and is behind her Commonwealth Games team-mates Eden Francis and Rachel Wallader. However, the 2013 European Junior Championships silver medallist threw a season's best to win the national under-23 title last week and looks for further success at the British Championships this weekend. "It's a big deal because it can put me in good stead for the Commonwealth Games," she said. "'I'll be competing against the other two England shot-putters, so that will be great experience before the Games. "My training has been about peaking for the Commonwealth Games and I'm really pleased that I'm coming into form just in time."